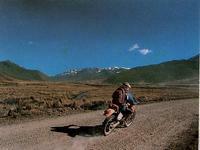 Flavio rides to the edge of the plateau and with a blip of the throttle is lost to view. It’s my turn next and my heart leaps to my mouth as I commit myself to the void. It’s something I just can’t get used to, but each time it does become a little easier as we learn how trustworthy our tour leader is. 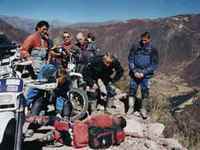 We, that is Todd and Jim from America and myself from the UK are on the second day of our adventure trail riding holiday in Peru. After the long flight from London, the holiday started for real in Lima, that mist and smoke clouded capital of one of the most fascinating countries on earth. We flew in and met up with Flavio and his driver / mechanic / cook / handyman Oscar for the three-hour drive down the coast to Paracas. After lunch at our hotel we went into the yard to become acquainted with our bikes, beautifully prepared and equipped XR600s. If, like me, your usual mount is an MTX125 then at first sight an XR600 is a bit daunting, but once you have the knack they start just as easily as a 125 and on the move the extra weight is so well balanced that you just don’t know it’s there. 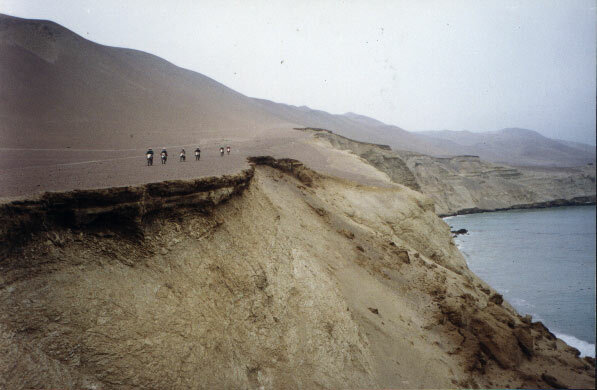 That afternoon we rode out onto the Paracas Peninsula to familiarize ourselves with the bikes, the terrain and one another. Todd and I already knew each other from a previous trail riding holiday in Baja (this had been organised by H-C Travel who organised this great tour). Jim, a friend of Todd, and Flavio, our trail boss, were both new to me but we soon welded into a riding team who looked out for each other and helped each other if ever help was needed. After the initial trepidation wore off, our first ‘test’ ride was enormous fun, across a vast area of hard packed sand dunes which we flew up and over and down and round and across until we really felt at home with the bikes, the terrain and one another. The evenings were spent yarning over dinner in some little cantina sussed out from many previous visits by Flavio and sure to provide good local food, drink and atmosphere at a very reasonable price. It was not to be all fun in the sand though. The next morning we were up early to take a boat out to the Ballestas Islands, the "poor man’s Galapagos". These islands are stuffed with sea lions, penguins and more sea birds than you could shake a stick at. The boat man would cut the motor and let the boat drift in stern first amongst the jagged rocks just to let us have a close-up of the basking sea lions and their harems. A quick burst on the engine would save us off the rocks just as it seemed we must founder. After lunch we kitted up and boarded the bikes through the ride to the first part of the Great Ica Desert. This area of Peru gets less than one inch of rain a year, unless of course El Niño strikes, when it may well get disastrous floods, which accounts for its barren but at the same time deeply eroded watercourses. It was on this part of the journey that we were doing "follow my leader" over the dunes. 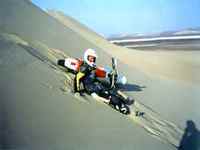 These dunes, which are anything up to 300 feet high, are very rideable, but once up on the tops which are flat, you can’t see the descent until you actually drop over the edge. Ok, so Flavio had done it a hundred times before, but for me, the first time, boy was I scared. That evening we rested at our hotel in Ica and the following day we journeyed on through the Great Ica Desert on roads that varied from the tarred but busy Pan-American Highway to a ten mile stretch of a deserted beach where we lunched on beer and sandwiches that were brought up to us in the Oscar driven support truck. Later that day we stopped to look at a looted pre Inca cemetery. It looked just like pictures I’ve seen of a WW1 battlefield. An area about as big as four football fields, covered with hundreds of craters where the graves had been dug out and the whole lot covered with human bones, skulls, fragments of cloth and broken pottery. The huaqueros (looters) had only been interested in the gold objects and fine pottery buried with the bodies. These items find a ready market on the international art market although, of course, the huaqueros get only a fraction of their value. 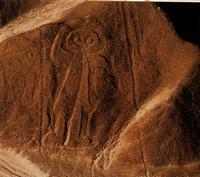 That afternoon, after riding 150 miles, we arrived in the town of Nazca, world famous for the enigmatic Nazca Lines. We were woken at 7:45 the next morning to be told to get ready immediately as the conditions were perfect for our flight to see the Nazca Lines (I told you it wasn’t all fun in the sand). The air field was only about a mile away so we were soon up in the air in a tiny four seater plane which, flying at about a thousand feet, gave us all a breathtaking view of these puzzling pre-historic markings. The area that is marked is a plateau of about 500 square miles which is covered with wind polished brown stones. Under the stones is yellow sand and the marks were made by collecting up the stones to expose the sand beneath. The stones were then used to edge the marks made. What is so intriguing is he scale of the "lines". Some, which appear to be pathways, run as straight as a ruler for anything up to 20 miles. Others are rectangles or triangles, again many hundreds of yards across. Still more are animals, birds, whales, monkeys, etc. and finally spirals. Various theories have bee put forward to account for them from Eric Von Dannikens nutty notion that hey are landing sites for extra-terrestrials, to more probable ideas that they are in some way connected with soon or moon worship. After our flight we once again set off on the bikes to visit a very remote bay where we were told the sea lions were so unused to human beings that it would be possible to walk among them. To begin with the trail was hard and rocky, but later it turned to sand and sand that sloped steeply to the left with a drop off to the sea at the bottom. I had great trouble with that rail and found myself sliding down the slope and getting nearer and nearer to the drop off. Just as I was about to give up, the track leveled out and we were soon down at the bay. Unfortunately the sea lions were not at home that day so after a rest and a stroll round we set off back. When I told Flavio of my problems on the way out he just said "Gain height, hit it hard and keep up momentum" I did all those things and soared home in triumph. Day four started early as we had a hard day's journeying ahead of us. We breakfasted in the dark and after stowing our overnight bags in the support truck jumped on the bikes and sped away up towards the town of Nazca. Just before the town we turned off onto a road which would take us high into the Andes to Cuzco over 400 miles away. The road was well surfaced and we quickly began to climb. It was certainly one of the best mountain roads that I have ever ridden, well surfaced with one hairpin after another with short straights in between. We would blast up the straights, change down and brake into the corners and then accelerate hard up the next straight. This went on for mile after mile and in the first three quarters of an hour we have climbed 4,500 feet. The views were staggering. Eventually the tar gave out and we were back to dirt, but hard packed dirt on which we could easily keep up 50 to 60 mph. We went over a pass at around 14,000 feet where the air began to feel decidedly thin. An answer was then given to our question "do you have to re-jet at high altitude?". The answer was "no". 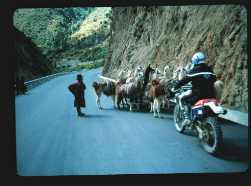 The bikes may run a bit rich but they still pump out the power and they ran as faultlessly at 14,000 feet they had at sea level and as they did the whole journey. We were now in Quechua country. These hardy mountain people are descendants of, and still speak the language of, the Incas and to great extent, in the remote areas, live a life very little changed from the time the Spanish occupation in Peru in the 16th century. Lunch that day was again in a cantina, but a new item on the menu was coca leaves. These are leaves from which cocaine is extracted, but in the mountains are commonly chewed as an antidote to altitude sickness. I tried them and found that the taste was foul, but that after a while one’s lips and gums began to go numb just like the after effects of a cocaine injection at the dentists. I can’t comment on their ability to stave off the effects of altitude because, fortunately, I never really suffered from it. We soon began to see herds of Vicuña, those strange, gentle, wild animals that look like a cross between a sheep, a deer and a camel. We also saw herds of Llama. These were domesticated animals with gaily coloured ribbons in holes in their ears to denote ownership. We began to meet with gangs of workmen, busy improving the road. Some bits were easy where were nearly finished, but other parts were a nightmare of stalled trucks, bulldozers, boulders and milling workmen. At one point we had to wait nearly an hour while the rock blasters finished their work and the bulldozers pushed enough of the boulders out of the way to enable us to get through. Of course, we on the bikes had an enormous advantage over everyone else as we could work our way up to the front of the queue and were always first away. Poor old Oscar in the support truck was miles behind. That night we camped for the first time, Oscar had finally caught up, but it was dark before we found the spot we were to camp at and it was a weary party that crashed out on the air beds that night. The next day was to be another marathon, altogether nearly ten hours in the saddle, but what riding, still at over 12,000 feet, still plenty of road works but plenty of good trail in between. So much trail in fact I think we were all secretly a little that the last three hours of riding brought us tarred roads once again. At last the reds roofs of Cuzco came into sight, lying in a valley below us and half an hour later we were in our hotel sipping "mate de coca", an infusion of coca leaves that the Quechua people use for every kind of malady from altitude sickness to hunger, hardly PG Tips but very welcome just the same. Cuzco, the ancient capitol of the Inca Empire is a town one could easily spend a month exploring. Inca ruins, buildings and cathedrals of the Spanish "Conquistadores" and present day Quechua homes and workshops. We had one day, but as the Winter solstice was only a few days away were lucky to see rehearsals for that great event, for although the population is nominally Catholic it is Catholicism that incorporates a large element of the old Inca faith. Life size statues of saints on massive litters are carried into the cathedral from the surrounding countryside to be blessed and carried in procession on the great day. Armies of Inca warriors march and countermarch, bands play and over all the great bells of the churches and cathedrals tolled incessantly. It was pure paganism subtly modified to satisfy the Christian church. The next day required no motorcycles. Breakfast was at six and soon after we were away to the railroad station for the ride up the Urubamba valley to Machu Picchu, that amazing stone built Inca city that was lost for nearly four hundred years. 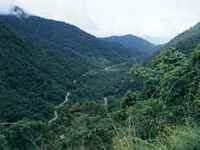 It sits on top of a ridge of rock in almost inaccessible jungle. All around on the mountain slopes are terraces that were cultivated to provide food for the population and incredibly there is a spring of water just where you least expect it, right in this town on the mountain. My words can’t do justice to it. You must see it for yourself. Our guided tour ended all too soon and it was back on the train the three and a half-hour ride back To Cuzco. The last two days of our Inca Adventure were to take us down to the other side of the Andes into the rain forests of the Amazon basin. The track down was hairy to say the least, a steep winding descent with a mountain on one side and a sheer drop on the other. As Jim said to me when we arrived at the bottom, "Man, that was some ride. If you missed your braking point you were one dead motorcyclist." Camp that night was on a bamboo platform way off the ground with a thatched roof over us. We were lulled to sleep by the sound of a massive waterfall that crashed into the jungle just across the way. It was a weary but exultant party that made its way back to Cuzco the following day. When the bikes that had carried us so effortlessly over so many miles were loaded into the back of the support truck we felt we were being parted from faithful old friends and it was with great regret that we knew we would never see them again. The next day we flew back to Lima while Flavio and Oscar started the long haul home by road. After one more night in this fascinating country we all went our separate ways. The adventure was over but the memories will last long after the bruises have faded.